Flag is an installation that explores the mechanics of choice, interpretation and identity. The work tries to establish an intimate connection between the artist and the audience through a rich interactive experience. The spectator is invited to choose among a set of symbols and words and to display them under the gaze of an active screen. The environment reacts by entering into an immersive narrative where surprise, judgment and acceptance are set into motion. The signs chosen by the spectator become small screens on which fragments of stories, characters and impressions appear. The behaviors and their sequencing are loosely inspired by a model of cultural shock. The interactive narrative makes use of a relational database of words. For each presentation of the work, a specific database will be built, based on the preconceptions and memories of the artist relative to the context of exhibition. 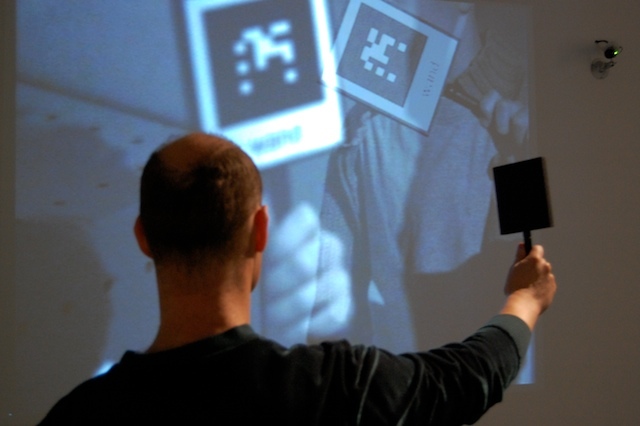 From a technical point of view, the project makes use of image-based mixed reality and artificial behavior. The work was produced using open-source softwares such as Drone, Ardour and ARToolKit. The spectator enters the installation space. The space is occupied by a set of small signs, a video projection and a security camera. An ambient and aerial sound scape enfolds the experience. 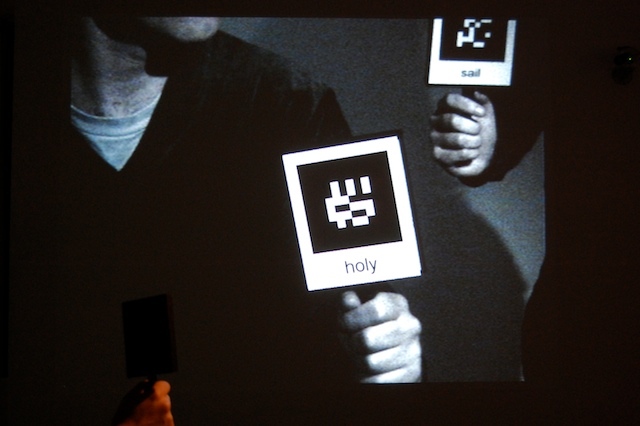 The projection shows a sequence of images from the last spectator interacting with the work. The signs each have a black and white symbol and a word printed on them: the spectator is invited to choose one. 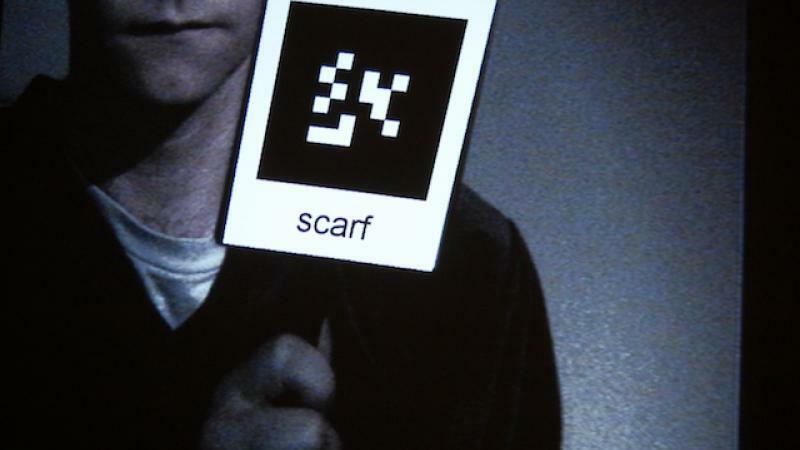 When the sign is shown to the camera, the installation reacts through a sequence of subtle image and sound effects. On the image, the word printed on the spectator's sign is changed, so that the spectator sees himself holding a different word. This is made possible thanks to a mixed reality algorithm. The installation goes through different steps, as if trying to make sense out of the words chosen by the spectator. In the first step, replacements are purely random. In the second step, the algorithm favors words that are close to its last choices, without yet taking the word chosen by the spectator into account. In the third step, it starts to make replacements with words that are close to the spectator's. It might then go back to another step and so on. Each step is tied to a specific set of audio and video effects. The links between words are input by the artist, before each presentation, in a relational database. Prémont, Charles. Sofian Audry présente Flag, in Le Lien Multimédia, April 22nd 2008. Wrong Time Wrong Place reportage about the exhibition and interview with the artist, on Antenne Rotterdam, June 22nd 2007.